Incendiary terrorism from Gaza continues, with 10 fires raging near the Gaza border. An IDF aircraft on Thursday evening attacked a terrorist squad in northern Gaza that launched incendiary balloons towards Israel. 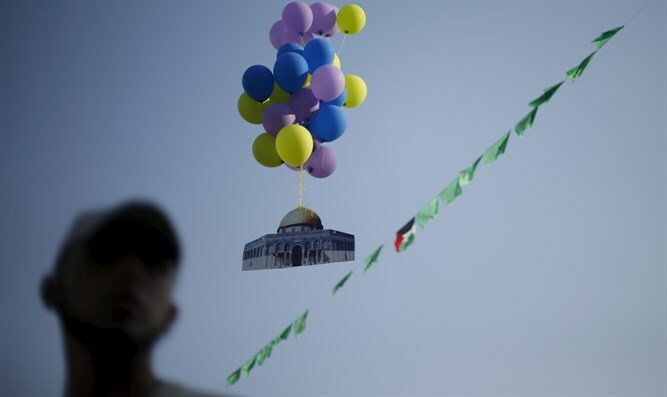 "The balloon terrorism is rising to the next level - this evening an explosive balloon landed in Moshav Mlilot, and immediately after its landing, the explosive device that was attached to it detonated," the Sdot Negev Regional Council said. "The balloon landed close to houses. The security coordinator of the moshav searched the area after the explosion and identified the location of the explosion. A police sapper who came to the area found shrapnel and parts of the balloon," the statement added. Throughout the day on Thursday, 10 fires broke out in areas located near the Gaza border, as a result of incendiary balloons fired from the Gaza Strip. The head of the Sdot Negev Regional Council, Tamir Idan, told Hadashot TV, "We see this very seriously. As far as we’re concerned this is terrorism in every sense of the word. We expect a strong response and rely on the IDF to know how to carry out the necessary actions in order to completely prevent terrorism of all kinds."